This state directory contains listings mainly of private investigators. There are also may be listings of attorneys, law enforcement people, security services, polygraph services, in house investigators for law firms, collection agencies, recovery agents, other law enforcement and forensics personal and other trade craft related to the profession which is stated as such in each individual listing that are NOT licensed to perform private investigative services. Before hiring any private investigator, you should contact the following state licensing authority to confirm current licensing information. 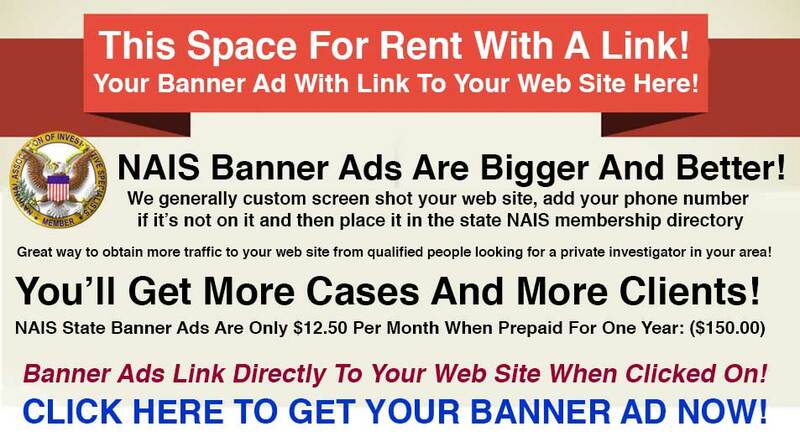 NAIS Member State Banner Ads With Link To Your Web Site! Position Is First Come First Serve. New NAIS banner ads are big. The length depends on how your web site is designed. Only $12.50 Per Month. Click Here To Order One Now.